“A compass seems to tremble ceaselessly but it takes the right direction at last. Just like a compass, although it seems like you are wandering, you are actually heading into the right direction.” This is a phrase spoken by Kim Je-dong during his talk concert, which was then quoted heavily in the Korean media. A concert usually refers to a music concert where loud music is played and colorful scenes fill the concert venue. A talk concert, however, breaks away from this general notion of a concert. It takes the form of a concert combined with a talk show, and its focus is on interaction through conversations between the audience and the speaker on stage. This new concept of a “talk concert” is currently appealing to the younger generation, particularly those in their twenties. For example, “The Kim Je-dong Talk Concert,” which is expected to be held in December, has already had all its tickets sold out. The concert has been held 197 times with 200,000 participants since 2009 and is the most popular talk concert in Korea. The main purpose of talk concerts is to enable conversation between the audience and the speaker regarding personal problems. Although the audiences of talk concerts are not limited to certain age groups, the number of talk concerts aimed at the twenties demographic is increasing. Aligning with this trend, talk concerts often visit universities to be held just for students. For example, on October 25, the talk concert “Ode to Youth” with Sung Si-kyung, a Korean singer, Kim Bo-sung, a Korean actor, and Hyeongdon and Daejoon, a hip-hop duo was held at Yonsei University. “As most young people are susceptible to feelings of insecurity, they are worried about their undecided future with no guidance being provided. In this situation, the demand for mentors is increasing and talk concerts are serving the role of mentors for them,” said Kim Hern-sik, a Culture Critic who contributes to the critic article of The Korea Economic Daily. Talk concerts were born when Kim Je-dong, a Korean entertainer, held “The Kim Je-dong Talk Concert” for the first time in 2009. 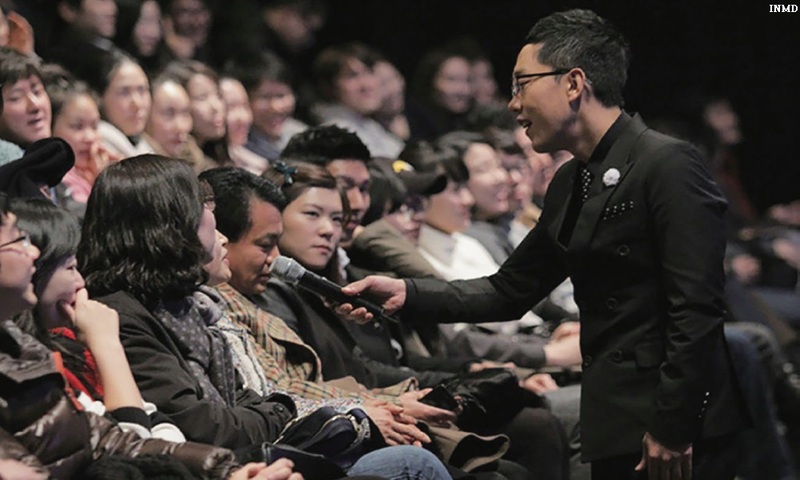 Although the concept of stand-up comedy is widespread abroad, it was unfamiliar to the Korean public. Kim Je-dong decided to plan a small talking performance similar to a stand-up comedy. The talk concert of Kim Je-dong, however, now focuses more on giving valuable advice to twenties, instead of just entertaining them. “I attended the Talk&Play Talk Concert and the speaker happened to be my favorite singer Sung Si-kyung. He talked with the audience and consulted some of the audience about love. I was satisfied just by the fact that I saw him and heard him speak. However, it was better when he sang his songs for the audience,” said Wee Yu-jin, a Freshman in the Department of German Language and Literature at Sogang University. With entertaining contents, talk concerts are currently becoming more popular among college students. There are various reasons why twenties enjoy talk concerts, but the most important reason is that people at the talk concerts can share common problems of those in their age groups, with celebrities as mentors. For example, in “The Kim Je-dong Talk Concert,” the speaker Kim Je-dong deals with problems which happen in university life throughout one session, appealing to young college audiences. “Being at the talk concert reassured me because I started to realize that my worries are not just mine alone. I found that everyone has similar problems as mine, and others go through situations which I can relate to,” said Wee. Although a talk concert is usually about two or three hours long, unlike ordinary lectures, the concerts are never boring, and always brings something new for the audiences to enjoy. For example, “Park Kyung-lim Talk Concert,” held in October at Ewha Womans University, consisted of not only talking with the audience but also performances, dancing, and the unexpected appearance of famous guests such as Jung Woo-sung, a famous Korean actor. People in their twenties worry about their uncertain future but at the same time seek pleasure rather than austerity. Talk concerts provide a place where their worries are heard and addressed in sincere and sympathizing ways without getting too serious. These concerts do not demand young people to live their lives in certain ways but instead, function as a place of comfort for the twenties who might be going through hard times. Through the interaction with celebrities who possess broad experience, those in their twenties can enjoy the concerts without feeling any pressure.